Just as they did on the opening weekend last season, the Warrington Wolves and Leeds Rhinos got their season underway with an encounter at Halliwell-Jones Stadium. Despite the Rhinos taking the honours by 16-12 in the corresponding fixture last season, the fortunes of the two sides couldn’t have been any more different, with the Wolves making the Grand Final while the Rhinos fought for their Super League place in the middle eights. 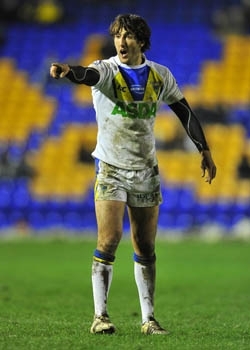 While the watchword for Warrington was continuity, with the odd well-chosen new signing to their squad, the Rhinos had big personel changes in terms as playing staff, as well as ex-player Dave Furner taking over as head coach. An open and fast first twelve minutes was dominated by great defensive efforts from both sides but when Konrad Hurrell was tackled without the ball when Leeds were in with a great chance of scoring, Jack Hughes was sin-binned and the Wolves were down to twelve men. Warrington went on the attack immediately and on fourteen Stefan Ratchford took a pass ten from the Leeds line, stepped past a couple of attempted tackles and grounded one-handed on the line to get the Wolves season up and running. The Primrose and Blue full-back added the conversion for a 6-0 lead. On twenty minutes Leeds conceeded the latest of a multitude of penalties, again for messing in the ruck, and Ratchford kicked a thirty metre goal to extend the lead as Hughes re-entered the fray, the home side taking an eight point lead while a man down. Josh Charnley opened his 2019 account as he concluded a passing move on twenty-eight to dove over by the right corner flag after taking a Ryan Atkins pass. Ratchford knocked over the extra two from wide for 14-0, the home side in total control with the Rhinos looking a distant second best. Just after half an hour had passed when Warrington got their third of the afternoon when Daryl Clark shrugged off three tackles to score under the sticks. Ratchford was again accurate with the boot for 20-0. There was some respite for Leeds as the minutes elapsed to the end of the half but the Wolves defence held strong and kept the visitors out. The Rhinos came out for the second half much improved after the wise dressing room words of Dave Furner, but it counted for nothing when on fifty-eight Wolves new boy Blake Austin worked a nice one-two with Toby King to scamper over from twenty metres. Ratchford converted for 26-0, the Rhinos condemned to an opening weekend loss. Toby King was sin-binned for a dangerous lift on Stevie Ward on seventy-three under his own sticks but great defence kept Leeds at bay with Charnley putting in a tremedous tackle to push Ash Handley into touch. The Rhinos avoided the nilling with four minutes left when Stevie Ward picked up a loose pass to go through a gap and stretch out his arm to score. Tu’Imoala Lolohea added the goal from in front of the sticks. A flying Handley was again denied by Charnley with seconds remaining as he tried a spectacular grounding and the final hooter sounded on a 26-6 win for the Wolves. This was a top drawer early season performance from the Warrington Wolves against an indisciplined Leeds Rhinos side who gave no indications of gelling in their new line-up, and who were very reminiscent of their form in the desperate days of last season. Leeds with a lot to think about, Warrington with the ideal start to the season. Rhinos: Walker, Briscoe, Watkins, Hurrell, Handley, Lolohea (G), Myler, Cuthbertson, Parcell, Merrin, Ferres, Sutcliffe, Ward (T). Subs: Dwyer, Donaldson, Oledzki, Singleton.